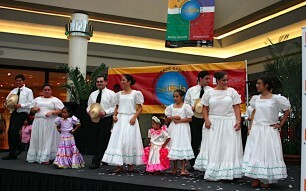 Puentes|LatiNOLA | Latino focused community based nonprofit for the Latino community of New Orleans and all Louisiana. 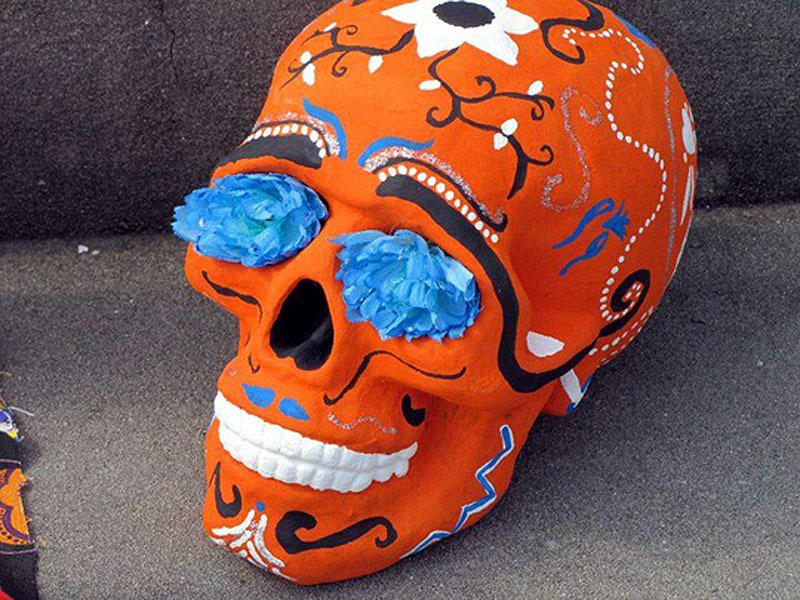 Celebrando Mardi Gras! en Puentes&LatiNola. We’re Moving | Nos Estamos Mudando!! A city wide cultural awareness program aimed at increasing civic participation. Create an asset base among the Latino community to develop and exercise community leadership skills. Policy and Advocacy focuses on criminal justice, youth, immigrant rights, open governance and language access. Give back and donate now! 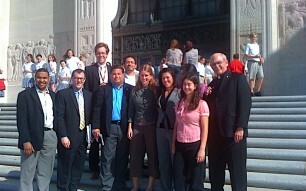 Become part of this positive change in the Latino community and the city we Love and Live in! 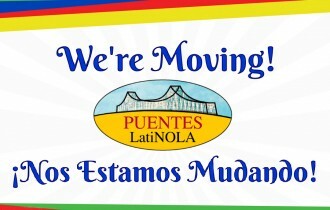 With great enthusiasm we announce that after eights years Puentes|LatiNOLA has found a new home and WE ARE MOVING! T he role of Puentes within the Latino community is to support the inclusion of Latinos in public, political and socio-economic life. 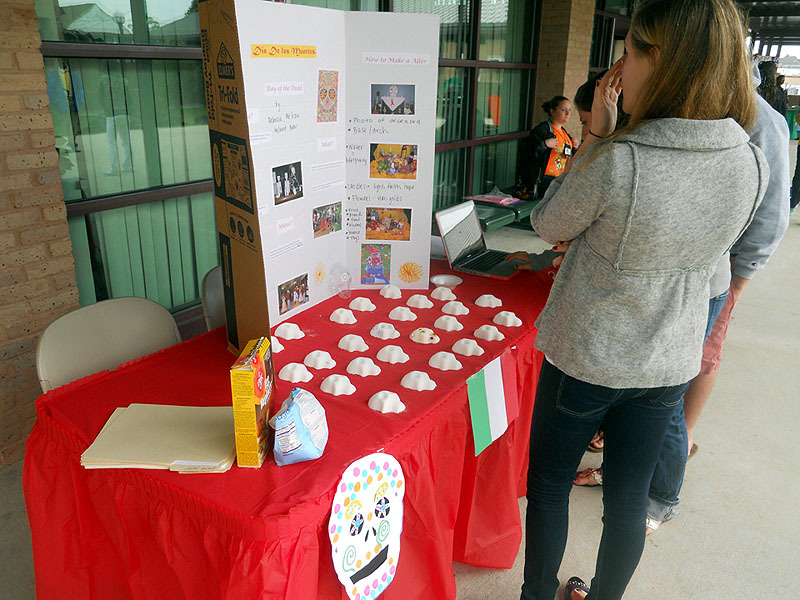 Puentes is implementing programs to provide better education for young Latinos; encouraging participation of Latino families in decision making processes that impact us; and advocating across ethnic lines for equitable distribution of resources, opportunity, and justice. Puentes strategy of community development concentrates on building the inter-ethnic power of the Latino community through its civic engagement and advocacy work. 600,000 Latinos turn 18 every year. That's 1.2 million every two years, enough to create 1.5 new congressional districts. We are happy to announce that in the coming days we will be relocating our offices to a new, community-friendly location in the heart of Mid-City. This move is a result of our continual efforts to expand our services, grow our capacity, and bring us closer to the community we serve. Unfortunately, we must push our grand opening blessing celebration a few days due to unforeseen construction delays. Contractors have confirmed and we invite you all to join us to celebrate and bless our home! 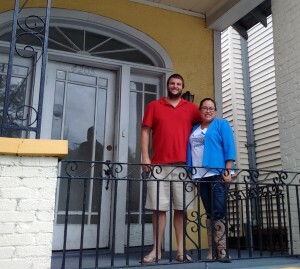 We are grateful and blessed to call Josh and Kelly our new SUPER property owners and community partners! Puentes|LatiNOLA’s work continues to grow and as a natural step of that growth we need more space. Our new office is significantly larger and it gives our staff and the community a greatly improved working environment, as well as room for continued expansion. Amazing what YOU can do and help make happen! We are grateful to business leaders Wynonne and Rufino Saavedra for their generous donation! RUFINOs Painting donated all the paint needed for our new offices. Build with us a community center! 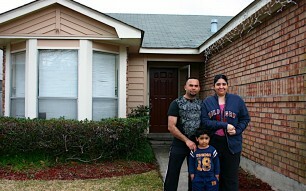 We still need furniture, a refrigerator and donations to help us make this new home work for us all! JOIN US! Email us at carolina@puentesno.org or call us at (504) 821-7228! A change like this does not happen very often and WE NEED YOUR HELP! This past week three amazing volunteers, Elizabeth, Israel and Jose Fermin have really helped us with packing and painting! JOIN them! We still need some help with painting, packing and moving! 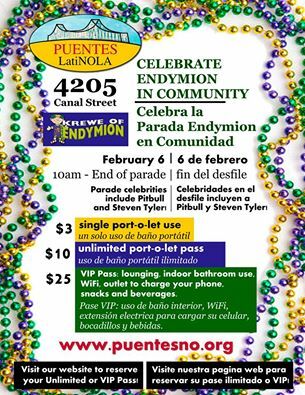 To VOLUNTEER email us at VOLUNTEER@PUENTESNO.ORG or call us at (504) 821-7228. Please leave a voicemail message. Help us furnish our new CASA! We are in need of conference room type furniture, training room type furniture, reception room furniture, a refrigerator, paint and painting supplies. 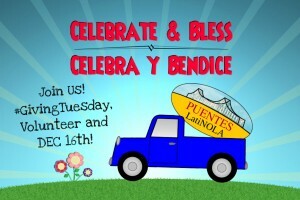 Please email us at VOLUNTEER@PUENTESNO.ORG or call us at (504) 821-7228 if you have something you would like to donate. To help us meet this new demand you can also make a small $5, $10, $20, or more $$ donation HERE! All of us at Puentes|LatiNOLA want to thank you for your friendship, partnership, loyalty, and support in 2015. 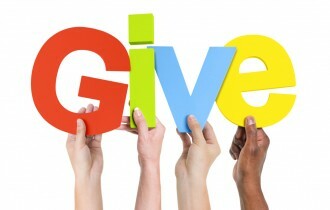 Welcome to Puentes|LatiNOLA’s online giving site. With just a few steps, you can make a gift to help Puentes|LatiNOLA provide vital educational services to children, youth, and adults, providing a brighter future for them, their families and their communities. Join us and be part of this positive change in the Latino community and the city we Love and Live in! 1. Donate online using our nonprofit partner Network for Good. Simply click on the “Donate Now Through” button below and you will be directed to our profile donation page on the Network for Good website where you can donate with any major credit card. Simply click on the “donate” button below and you will be directed to the Paypal site where you can donate with any major credit card or from your bank account. Use email admin@puentesno.org. 3. Send a check made payable to Puentes New Orleans, Inc.
4. Call Kenneth Routon, Grant Writer and Development Coordinator at (504) 821-7228 to make your gift over the phone. You may also email Kenneth to schedule a phone call at kenneth@puentesno.org. 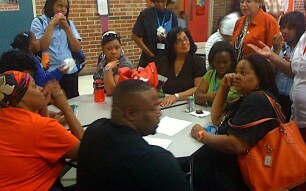 Puentes New Orleans works with a large number of local and national organizations. Meet our funders and partners! Puentes New Orleans was established in 2007 as a 501 (c) (3) nonprofit Latino community development organization in the Greater New Orleans area. 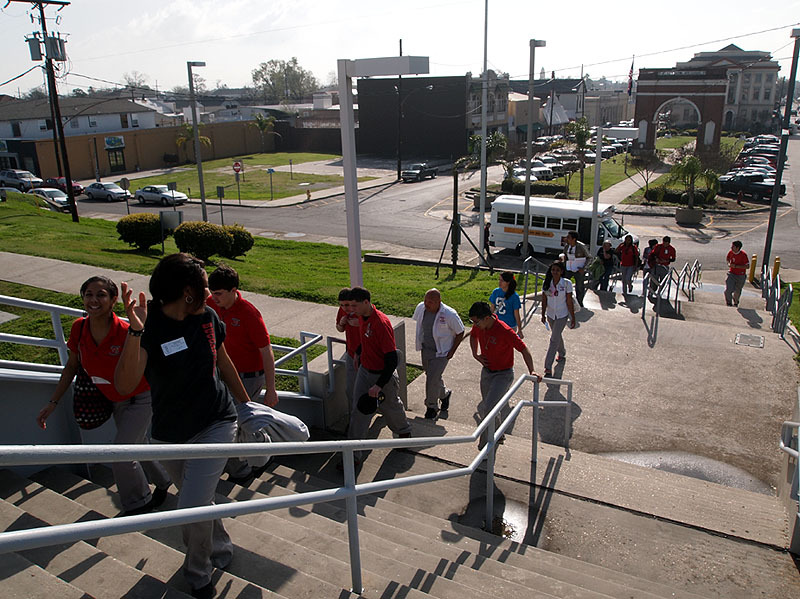 Puentes was created to address the needs of Latinos in the aftermath of Hurricane Katrina and since then has been working to promote social change through active civic engagement and policy and advocacy in the areas of education, criminal justice, open governance, economic asset building and leadership development. © Copyright 2010-16 Puentes New Orleans All Rights Reserved.